A group of college students go into the deep woods of the most haunted town in America to better understand fear - and they found it. ©1992 Third Mind Records/The All Blacks B.V.
Ok, I admit, I have not seen the original yet; but in all this movie isn't all that bad. The idea of objects (like a clock in Amityville 6 (1992 it's about time) or a mirror in this tale (Amityville 7) carrying the original horrors are a bit hokey, but then again it makes sense. 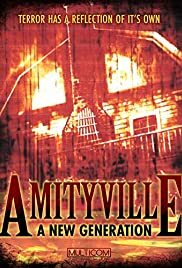 I liked this movie better than its time traveling predecessor and this one gives an interesting history if an Amityville family through the deranged father/psyco-killer handing the mirror and its inner demons to his son (who unknowingly accepts the gift and the re-opening of buried images/memories). Maybe it was because I was in New York and Amityville is in Long Island, but this film is at least average (hence a 5 or 6).